According to a projection from Forrester Research, eCommerce spending in the United States will reach approximately $262 billion this year, a 13.4% increase from 2012. This compelling number means that the eCommerce marketplace is becoming more competitive. Companies need to make sure they are actively putting their product in every space available. Social media is a powerful outlet for any brand to get their message out to potential customers. For eCommerce brands specifically, social media should be a key component of a company’s sales strategy. Social media makes products easily accessible and shareable across the web and encourages shoppers to buy. In this post, I’ll examine four eCommerce companies who use social media to advertise their products and engage customers. ShopSocially is a company that provides a suite of social apps that you can embed on your website or integrate into social media. 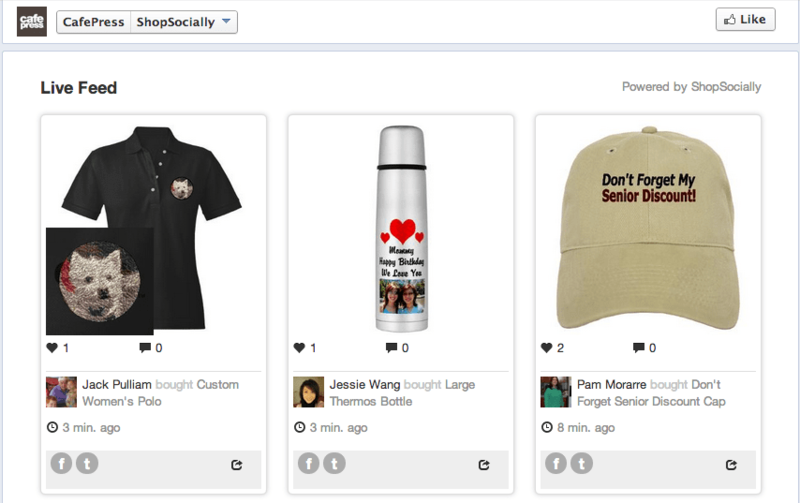 CafePress uses the Shopping Community app on their Facebook page to provide a live feed of what shoppers purchase on their site. This powerful tool allows CafePress to increase visitor engagement on Facebook, enables social discovery of their products, and increases trust by displaying shopper testimonials. Check out this interesting case study about how CafePress used a variety of ShopSocially’s apps to get qualified Facebook fans, increase conversion rates, and achieve a significant ROI. Promoting deals through your social media network can be an effective way to encourage sales. 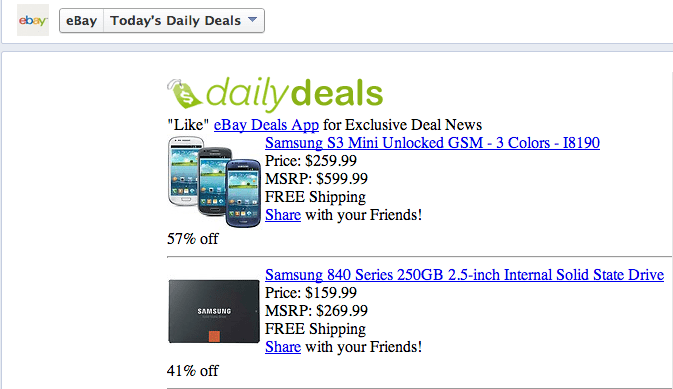 eBay, one of the top eCommerce retailers in the world, has a tab on their Facebook page called Daily Deals that allows fans not only to explore deals but to also share them with their friends. In addition to exploring and sharing, The Shared Deal app from ShopTab also allows fans to start the buying process straight from Facebook. A common use of social media includes responding to customer feedback and support issues. For eCommerce companies, this is crucial. A member of your support team should monitor social media networks throughout the day to ensure any questions or comments are responded to. 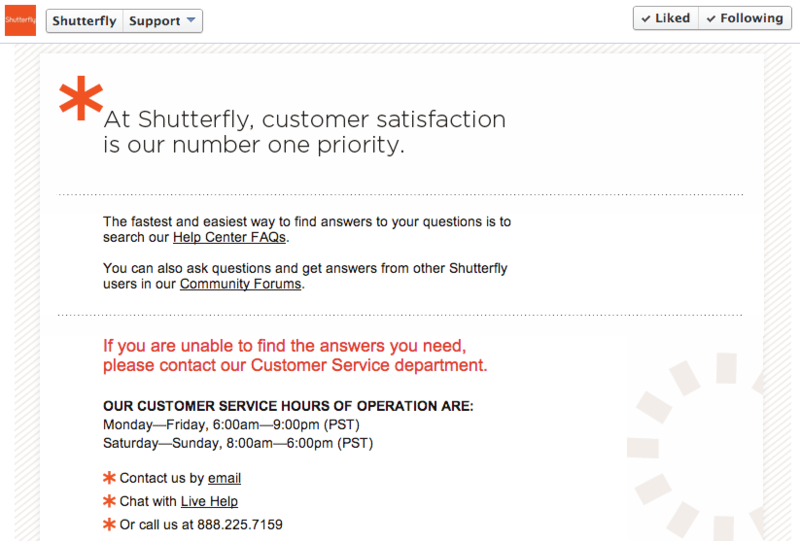 Shutterfly does a great job at providing support for their customers by including a Support tab on their Facebook with a link to FAQ’s, live help, and community forums, as well as customer service contact information. Another idea could be to create a Twitter account specifically dedicated to Customer Service, such as Microsoft or Verizon have done. If you are an eCommerce website and you have a blog, you should be taking advantage of the real estate surrounding the text in your blog posts by including more than just the typical blog categories and blog roll. 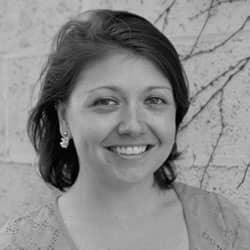 Add compelling call-to-actions (CTA) and other useful information such as writer bios. 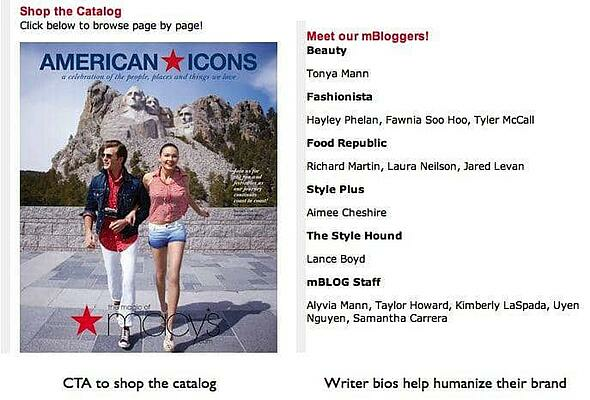 One way that the Macy’s blog utilizes this space is by having a CTA to browse a digital version of their catalog. They also have a section where they introduce their bloggers. For eCommerce, this is a great idea because it helps to humanize your brand. Another idea is to have a CTA with a link to a Featured Product or Brand. An eCommerce brand cannot succeed at social media by just being there. Think of your fans and followers as social consumers and give them a platform to socially engage throughout the entire purchase process, turning them from strangers or visitors into delighted customers and brand ambassadors. Are there any eCommerce BRANDS that stick out in your mind as SUCCECSSFUL IN THE SOCIAL MEDIASPHERE? I’d love to hear about them in the comment section below!